Based on a 24-month contract for all MyRepublic fibre broadband plans: 1Gbps ULTRA at $49.99/mth, 1Gbps GAMER at $59.99/mth. The one-time standard service activation charge of $58 for ULTRA and GAMER applies for this promotion. Free $100 router discount applies for new routers purchased from MyRepublic during sign-up only. Free 3 Months of Home Voice subscription applies only to Home Voice Plus plan, after which its Usual Price of $2.88/month will apply. A one-time installation fee of $49 applies to all Home Voice sign-ups. The free 3 Months of Teleport subscription is valid for new sign-ups only after which $1.88/month will apply for 12 months. 12-month MyRepublic fibre broadband plans are available at the following promotional rates: 1Gbps ULTRA at $65/mth, 1Gbps GAMER at $75/mth with a $58 installation fee and no free months. Discount rates are valid for the duration of the contract. 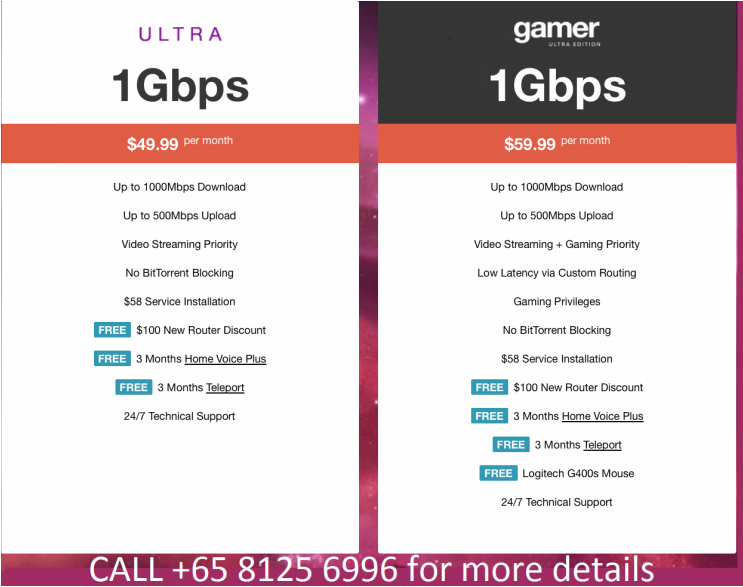 The plan's Usual Price of $89/month for ULTRA and $99/month for GAMER applies after contract plan ends. Sign-ups are only valid for National Broadband fibre-ready premises. MyRepublic reserves the right to replace the free Logitech G400s with an item of similar or equal value.